Even though the November 8 election is in the rear-view mirror for most voters, in the last few days Elk Grove voters may be experiencing a Déjà vu of political activity. The Déjà vu came when signature gatherers landed in Elk Grove over the last several days seeking signatures to qualify a ballot measure to reverse a recent decision by the Elk Grove City Council. 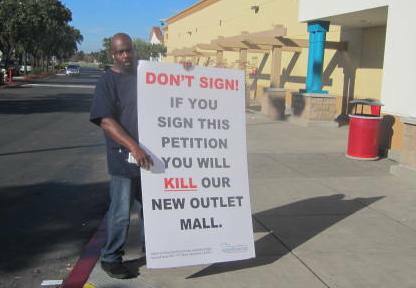 That decision released the Howard Hughes Company from a development agreement regarding its still unfinished Outlet Collection at Elk Grove shopping center. Today's phone call came from Sacramento-based advocacy group Region Business with a message from their Executive Director Joshua Wood advising Elk Grove voters not to sign the petition. If enough signatures are obtained and qualified for a ballot, the voters would be asked to reverse the decision. If voters overturned the Elk Grove City Council's vote, the development agreement would be back in force. One of the gatherers told Elk Grove News yesterday they have already secured 4,000 signatures. Although Arnol Petition Services is identified as the entity organizing the petition drive, they have not returned calls seeking comment on their Elk Grove activities or who is their client. Although the vote would have implications for the resumption of construction on the shopping center, another effect would be on the Wilton Rancheria's proposed $400-million casino proposed for a portion of the current site of the Outlet Collection at Elk Grove. The development agreement could be a road block to the Wilton Rancheria's efforts to place the 36-acre parcel they are seeking to purchase from HHC into Federal trust required for construction of the casino. Reached by phone this afternoon Wood said he did not know who is funding the petition drive and did not speculate. He did question their lack of transparency, though. "Tell us who is funding you," he said. "What do you have to hide?" The audio message can be heard below.